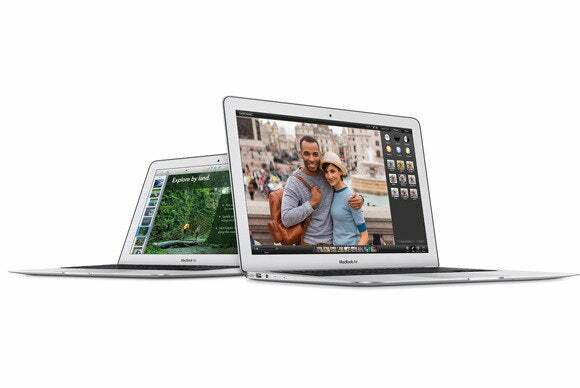 Editor's note: This review was updated on 5/20/14 to include the $1099 11-inch MacBook Air with 256GB of flash storage. There’s not much new about Apple’s updated MacBook Air lineup. Fortunately, the Air was already a top-notch portable computer. The subtle increase in processor speeds, along with a respectable decrease in price, are obvious positive steps for consumers. And while the faster processor did help the new MacBook Air in our application tests, the flash storage didn’t always perform as well as we’ve come to expect. The latest MacBook Air models are available in four standard configurations, two with 11.6-inch screens, and two with 13.3-inch screens. All four configurations have the same Intel 1.4GHz dual-core Core i5 processor, which is 100MHz faster than the 1.3GHz dual-core Core i5 processor found in the mid-2013 MacBook Air. Everything else about new MacBook Air is the same as last year’s model: 4GB of DDR3 memory, Intel HD 5000 integrated graphics, and either 128GB or 256GB of PCIe-connected flash storage. Prices start at $899 for the 11-inch MacBook Air with 128GB of flash storage. For $1099, you get the same 11-inch system but with 256GB of flash storage. The 13-inch MacBook Air with 128GB of flash storage is $999, and its 256GB counterpart is $1199. Across the line, the mid-2014 MacBook Air is priced $100 lower than the corresponding configurations from mid-2013. You can increase the RAM from 4GB to 8GB for an extra $100. Like last year’s model, RAM is not user upgradable, so if you think you might need more than 4GB, be sure to order your MacBook Air with the additional memory. You can also opt for 512GB of flash storage, a $300 upgrade to the 256GB models. The processor can also be upgraded to a 1.7GHz Dual-Core Intel Core i7 for $150—the same processor upgrade offered last year. 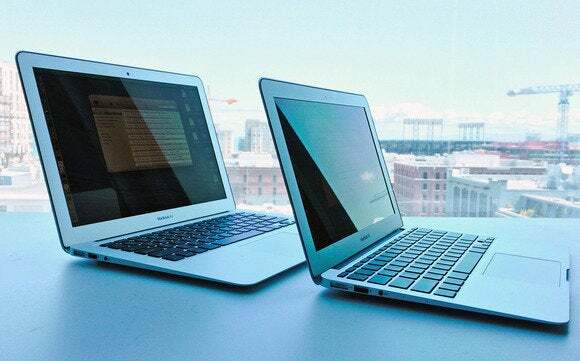 Externally identical to their mid-2013 predecessors, the MacBook Air still weighs in at 2.38 pounds (11-inch) and 2.96 pounds (13-inch). They also have the same number and types of connections: two USB 3.0 ports, one Thunderbolt port (not Thunderbolt 2), a MagSafe 2 power port, and an audio in/out combo jack. The 13-inch model still includes a SDXC Card slot that the 11-inch model continues to lack. The 11.6-inch and 13.3-inch displays keep their same resolutions, 1366-by-768 and 1440-by-900, respectively—the new MacBook Air does not include a Retina display like some analysts had predicted. We used our overall system performance benchmark suite, Speedmark 9, to compare two models of the new MacBook Air to the previous models. In our tests, the new $899 11-inch MacBook Air with 128GB of storage, the $1099 11-inch MacBook Air with 256GB of storage, and the $1199 13-inch MacBook Air with 256GB of storage outperformed the previous systems in most tests, if only by a few seconds. The new 1.4GHz models were between 2 and 5 percent faster in tests such as Photoshop, iTunes, Handbrake, Cinebench CPU test, Aperture and PCMark 8’s Office application test running on a virtual machine in Parallels. Storage performance tests, on the other hand, showed the flash storage in these new systems to be slower than last year’s. Slow enough to drag down the overall Speedmark score, despite the faster processors found in this year's models. You can read our full benchmark report, but in short, the 128GB flash storage devices in the MacBook Airs we tested are slower than the 256GB flash storage. This isn't new and we've seen this before, but for some reason the flash storage in the 2014 MacBook Air performed slower than the flash storage with the same capacity in last year's models. If you’re looking for a more powerful portable, the $1499 13-inch Retina MacBook Pro with 256GB flash storage, 8GB of RAM and 2.4GHz dual-core Haswell processor was 22 percent faster overall than the new 13-inch 256GB MacBook Air. The 13-inch MacBook Pro also has the benefit of a high-resolution Retina display, two Thunderbolt 2 ports, and faster Intel Iris graphics. Our battery tests showed that the new MacBook Air was able to maintain its superior battery life. We looped a movie file in iTunes at 200 CD/m2 brightness, with Wi-Fi off and the keyboard dimmed. The 11-inch MacBook Air lasted 9 hours and 39 minutes, 20 minutes longer than last year’s 11-inch. The 256GB 11-inch Air lasted 9 hours and 35 minutes. The new 13-inch MacBook Air lasted 12 hours and 13 minutes, 23 minutes longer than our previous 13-inch MacBook Air. The 13-inch MacBook Pro with Retina display lasted 9 hours and 48 minutes. The MacBook Air is a great portable system. Thin and light with long battery life, the MacBook Air’s inclusion of Thunderbolt and USB 3.0 ports also allow them to work respectably as a desktop system when at the office. The 128GB flash storage isn’t as fast as larger capacities, so I’d recommend going with one of the models outfitted with 256GB.